This news item was posted in C category and has 0 Comments so far. Do you wonder that when others around you seem to be enjoying the nice breeze, why do you have to wrap yourself up in a sweater? Well, I am sure the people around you might wonder or feel perplexed with your behavior. Even you might have wondered and asked yourself this question. Why am I feeling cold all the time? 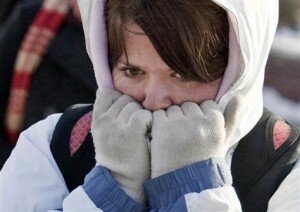 Well, feeling cold all the time might be linked to certain medical conditions. The human body’s response or sensitivity towards cold might vary from person to person. If you are one of those people who stay wrapped in extra clothing even when others around you might be comfortable in light clothes, you must look into your lifestyle in order to ascertain the factors that are responsible for you feeling cold all the time. Read more on why am I always cold. Do you have a habit of skipping meals? If yes, then your body’s ability to keep itself warm might be affected in an adverse manner due to certain nutritional deficiencies. Skipping meals or eating an unhealthy diet can certainly affect your body’s response to cold. So, for those who are feeling cold all the time, it is very important to look into their dietary habits and bring about changes. Are you under weight? If yes, then you are definitely more prone to experiencing symptoms of feeling cold all the time. Do you shiver more often? Our muscle mass and fat are greatly responsible for keeping us warm and cozy. Larger mass will generate more heat and fat will help in retaining the body heat. In case you have lost a lot of weight recently, it might have led to increased sensitivity to cold. If you are feeling cold all the time, you must get yourself checked for hypothyroidism. You must get TSH test done. If the thyroid stimulating hormones is not within the normal range, you must start taking the medications for treating this medical condition. Those who are anemic might also experience this feeling. Generally people who are anemic complain of feeling cold all the time. A simple blood test can be used to determine if you are anemic or not. Anemia is caused when the number of healthy red blood cells in our body decrease. These red blood cells are responsible for carrying adequate oxygen to our tissues. In case of people suffering from anemia, the red blood cells are destroyed faster than they can be replaced. Read more on anemia symptoms and treatment. Women between the age of 20 and 40 are prone to this condition. This is a medical condition which can be triggered by cold temperature and emotional stress. During an attack, the patient’s blood vessels become constricted and this affects the blood circulation. One of the most common symptoms of Raynaud’s disease is tingling sensation in fingers and toes. Generally people who are suffering from this condition react to slightest change in temperature. Read more on Raynaud’s syndrome. Hormonal imbalances can also be responsible for the increased sensitivity to cold temperature. In case of women, the fluctuation in the levels of estrogen might play a great role. Women who are pregnant or those going through menopause might also complain of feeling cold all the time due to hormonal changes. Aging can bring about a lot of changes in the body. Many old people have this complaint of feeling cold all the time. Aging can be accompanied with weakened immunity and that can increase the sensitivity of people towards cold. Now that you are aware of the causes of feeling cold all the time, you can tackle this problem by getting yourself medically examined. In case you are suffering from nutritional deficiencies or anemia, you must improve your dietary habits. Stress can also trigger certain hormonal imbalances, therefore, you must stay stress-free. As far as hypothyroidism is concerned, you will need to follow the advice of your doctor. Once the medical condition is treated, you might find changes in your body’s reaction to cold. So, if you are amongst those who are feeling cold all the time, get yourself medically examined and make some lifestyle changes to tackle this condition.